The face of Vogue and American fashion is getting another documentary, this time on the bacchanalian fashion fête that is the Met Ball. What is the Met Ball and why does it deserve to be the focus of a whole documentary, you ask? Only the premier red carpet gala of the year, held in honor of the annual exhibit at the Metropolitan Museum of Art’s Costume Institute. It draws just about every celebrity you can think of who has an eye for fashion. And those who don't. "The Met Ball is the Super Bowl of social fashion events," quips André Leon Talley in the newly released trailer. 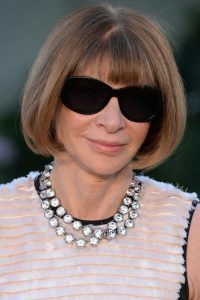 Andrew Rossi, who directed Page One: Inside the New York Times, followed Anna Wintour and Vogue staff as they prepared for last year's ball that followed the exhibit's theme, China: Through the Looking Glass. He surely learned invaluable lessons.